Thanks for posting those, they look pretty neat. I'd really like to get the Muppet/Star Wars set, being a fan of both of those. The other stuff is neat too, and I'd almost be tempted to try and get the Padme/Leia dress set thing for our daughter (when she's older). I'll actively be in search of the Yoda characters and I really like the concept of those Padme / Leia sets as well. Hasbro should take note of all those outfits and accessories. I really like the concept of those Padme / Leia sets as well. My niece has a bunch of the dress-up figure sets based on the various Disney princesses (Beauty & Beast, Mermaid, Cinderella, etc). I bet she'd love these as well. Very cool to see them include SW in the line like that. More Disney items to buy. I like the Indy. Yeah, my daughter loves the Polly Pocket characters so she can dress them up, so this is a neat way to do SW for girls. EndorExpress.net has a picture of the new Star Tours five pack. It includes R2, C3po, Rex-24, WEG-1618 and DL-X2. So, how do I go about trying to get the Leia/Padme sets? Is stuff like this available if you call Disney directly and have it shipped to your home or is Ebay my only option? I have to have those sets - they are what I've always wanted from Hasbro but never got. Some of their stuff can be ordered through their ordering system. try 407-363-6200 as it gets closer to their star wars weekends. Thanks for the number - I will definitely try that next month. You could just ask me. I go to Disneyland about once a month. Thats awesome, i wish i was close enough to do that. Here is a press release of new Star wars stuff from the Disney Store. Looks like they will give Hasbro a run for its money. They will probably take over the brand eventually. These are the same guys that made big star speeder. We went to the closest Disney Store this past weekend while doing some other shopping. 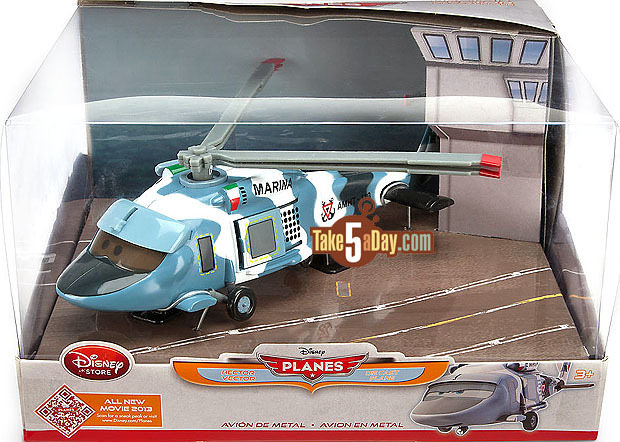 I purchased my son the Disney Planes Hector Vector die-cast, in the same price range as what the Star Wars die-casts will be... If the scale on the SW product is close to the scale on this toy... We will be very pleased. The box for this thing was around 10 inches square, I believe. A standard size "car" can fit inside the door you see. This toy was originally $20, but I got it on clearance for around $13.